Père Lachaise Cemetery (French: Cimetière du Père-Lachaise, [simtjɛːʁ dy pɛːʁ laʃɛːz]; formerly, cimetière de l'Est, "Cemetery of the East") is the largest cemetery in Paris, France (44 hectares or 110 acres). With more than 3.5 million visitors annually, it is the most visited necropolis in the world. Père Lachaise is located in the 20th arrondissement and notable for being the first garden cemetery, as well as the first municipal cemetery in Paris. It is also the site of three World War I memorials. The cemetery is on Boulevard de Ménilmontant. The Paris Métro station Philippe Auguste on Line 2 is next to the main entrance, while the station named Père Lachaise, on both Line 2 and Line 3, is 500 metres away near a side entrance. Many tourists prefer the Gambetta station on Line 3, as it allows them to enter near the tomb of Oscar Wilde and then walk downhill to visit the rest of the cemetery. The cemetery of Père Lachaise opened in 1804. The cemetery takes its name from the confessor to Louis XIV, Père François de la Chaise (1624–1709), who lived in the Jesuit house rebuilt during 1682 on the site of the chapel. The property, situated on the hillside from which the king watched skirmishing between the armies of the Condé and Turenne during the Fronde, was bought by the city during 1804. Established by Napoleon during this year, the cemetery was laid out by Alexandre-Théodore Brongniart and later extended. Napoleon, who had been proclaimed Emperor by the Senate three days earlier, had declared during the Consulate that "Every citizen has the right to be buried regardless of race or religion”. 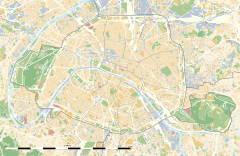 As the city graveyards of Paris filled, several new, large cemeteries, outside the precincts of the capital, replaced them: Montmartre Cemetery in the north, Père Lachaise in the east, and Montparnasse Cemetery in the south. Near the middle of the city is Passy Cemetery. At the time of its opening, the cemetery was considered to be situated too far from the city and attracted few funerals. Moreover, many Roman Catholics refused to have their graves in a place that had not been blessed by the Church. During 1804, the Père Lachaise contained only 13 graves. Consequently, the administrators devised a marketing strategy and during 1804, with great fanfare, organized the transfer of the remains of Jean de La Fontaine and Molière. The next year there were 44 burials, with 49 during 1806, 62 during 1807 and 833 during 1812. Then, in another great spectacle of 1817, the purported remains of Pierre Abélard and Héloïse d'Argenteuil were also transferred to the cemetery with their monument's canopy made from fragments of the abbey of Nogent-sur-Seine (by tradition, lovers or lovelorn singles leave letters at the crypt in tribute to the couple or in hope of finding true love). This strategy achieved its desired effect: people began clamoring to be buried among the famous citizens. Records show that the Père Lachaise contained more than 33,000 graves during 1830. Père Lachaise was expanded five times: during 1824, 1829, 1832, 1842 and 1850. Presently there are more than 1 million bodies buried there, and many more in the columbarium, which holds the remains of those who had requested cremation. The Communards' Wall (Mur des Fédérés), located within the cemetery, was the site where 147 Communards, the last defenders of the workers' district of Belleville, were shot on May 28, 1871. That day was the last of the "Bloody Week" (Semaine Sanglante), during which the Paris Commune was crushed. Today, the site is a traditional rallying point for members of the French political Left. Ironically, Adolphe Thiers, the French president who directed "Bloody Week," is also interred in the cemetery, where his tomb has occasionally been subject to vandalism. A funerary chapel was erected during 1823 by Étienne-Hippolyte Godde at the exact place of the ancient Jesuit house. This same Neoclassical architect created the monumental entrance a few years later. A columbarium and a crematorium of a Neo-Byzantine style were designed in 1894 by Jean-Camille Formigé. Map of the Père-Lachaise Cemetery. Père Lachaise is still an operating cemetery and accepting new burials. However, the rules to be buried in a Paris cemetery are rather strict: people may be buried in one of these cemeteries if they die in the French capital city or if they lived there. Being buried in Père Lachaise is even more difficult nowadays as there is a waiting list: very few plots are available. The grave sites at Père Lachaise range from a simple, unadorned headstone to towering monuments and even elaborate mini chapels dedicated to the memory of a well-known person or family. Many of the tombs are about the size and shape of a telephone booth, with just enough space for a mourner to step inside, kneel to say a prayer, and leave some flowers. The cemetery manages to squeeze an increasing number of bodies into a finite and already crowded space. One way it does this is by combining the remains of multiple family members in the same grave. At Père Lachaise, it is not uncommon to reopen a grave after a body has decomposed and inter another coffin. Some family mausoleums or multi-family tombs contain dozens of bodies, often in several separate but contiguous graves. Shelves are usually installed to accommodate them. During relatively recent times, the Père Lachaise has adopted a standard practice of issuing 30-year leases on grave sites, so that if a lease is not renewed by a family, the remains can be removed, space made for a new grave, and the overall deterioration of the cemetery minimized. Abandoned remains are boxed, tagged and moved to Aux Morts ossuary, in Père Lachaise cemetery. Plots can be bought in perpetuity or for 50, 30 or 10 years, the last being the least expensive option. Even for the case of mausoleums and chapels, coffins are most of the time below ground. Although some sources incorrectly estimate the number of interred as 300,000 in Père Lachaise, according to the official website of the city of Paris, one million people have been buried there to date. Along with the stored remains in the Aux Morts ossuary, the number of human remains exceeds 2–3 million. Behind the Aux Morts (To the Dead) monument sculpted by Paul-Albert Bartholomé lies an ossuary of the bones of Parisians from cemeteries all over the city, a smaller kind of modern-day catacombs. Although the monument is well known, it is not general knowledge that it is also an ossuary, and its doors usually remain closed and locked to the public. When it became overcrowded recently[when? ], the bones were removed for cremation and returned to the ossuary after the incineration process. In the Père Lachaise ossuary, efforts are made to store bones and ashes in separate boxes. ^ "Cimetière du Père-Lachaise", Paris Tourist Office article. ^ "Burial Grounds." International Encyclopedia of the Social Sciences. Ed. William A. Darity, Jr. 2nd ed. Vol. 1. Detroit: Macmillan Reference U.S., 2008. 392-393. Gale Virtual Reference Library. Web. 27 Sept. 2013. ^ Etlin, Richard A. (1984). "Père Lachaise and the garden cemetery". The Journal of Garden History. 4 (3): 211–222. doi:10.1080/01445170.1984.10444096. ^ "Passy Cemetery". www.fodors.com. Fodors. Retrieved 17 June 2015. ^ a b Mairie de Paris (27 April 2012). "Père-Lachaise cemetery". Paris.fr. Archived from the original on 5 December 2011. ^ Planet, Lonely. "Cimetière du Père Lachaise in Paris, France". ^ "Commune of Paris, 1871". Encyclopedia Britannica. ncyclopædia Britannica, Inc. Retrieved 4 December 2018. ^ "Frequently Asked Questions about Paris Cemeteries". Pariscemeteries.com. Archived from the original on 8 October 2011. ^ "Père-Lachaise Cemetery: Interesting Thing of the Day". Itotd.com. 15 March 2005. This page was last edited on 4 March 2019, at 17:43 (UTC).